Any modelling study of higher penetration wind and solar scenarios must take into account the cost of intermittency. This article describes one such study which estimates the optimal long-term share of onshore wind and solar PV in north-west Europe at around 20% and 2% respectively. A CO2 price of €20/ton was assumed and technology costs were assumed to fall by 30% for onshore wind and 60% for solar PV. As someone who makes a living from the modelling of complex non-linear systems (multiphase reactors), I have great appreciation for the work of Lion Hirth at the Postdam-Institute for Climate Impact Research, Vattenfall GmbH. As any good modelling study should, his work on the north-west European power system (covering Germany, Belgium, the Netherlands, Poland and France) reveals and elegantly explains a number of seemingly counter-intuitive effects regarding higher penetration renewable energy futures. Hirth has authored numerous papers on the subject of valuing intermittent renewables at higher penetrations, but his paper on the optimal share of intermittent renewables is arguably the most insightful. This paper calculates the welfare-optimal deployment mix for north-west Europe, taking into account the negative effect that intermittency has on the value of wind and solar at higher penetrations (discussed in a previous article). This article will give a brief summary of this very interesting paper. 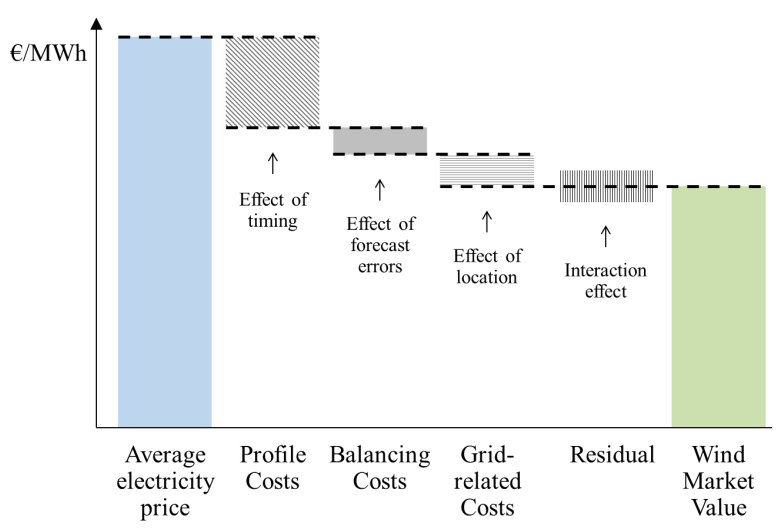 Hirth identifies three easily understandable integration costs of intermittent renewables at higher penetrations: profile costs (effect of timing), balancing costs (effect of forecast errors) and grid-related costs (effect of location). A typical effect of these costs is shown below. Profile costs are primarily related to the underutilization of power infrastructure as a result of intermittent electricity surges enjoying priority dispatch. This is typically the largest cost related to the intermittency of wind and solar. Balancing costs are related to the spinning reserve requirement to prevent blackouts from forecasting errors and are typically reasonably small. Grid-related costs arise from the necessity to bring wind/solar power from windy/sunny locations to population centres and varies greatly from one case to another. For north-west Europe, the effect of these costs on the value of onshore wind relative to the wholesale power price is shown below. Note that the long-term trendline assumes that the entire power system is optimized for increased wind penetration and is therefore only applicable beyond 2030. The mid-term line takes into account the sunk investments in existing capital stock. The paper details a comprehensive sensitivity analysis to understand how the optimal share of intermittent renewables changes in response to various parameters. The most important of these will be briefly discussed below. Note that all results are long-term results (following the blue line in the figure above). 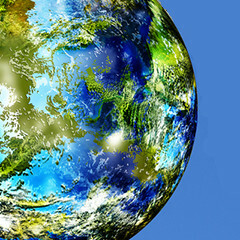 Energy storage and increased interconnectivity (i.e. the supergrid) are commonly quoted as solutions to the variability of solar and wind. However, the study found that both these options had fairly small effects on the optimal share of wind power (shown below). In the case of storage, this was simply because wind variations typically occur on a much longer timescale than the storage capacity of the pumped-hydro facilities considered in the model. Further increases in the degree of interconnection beyond the current level also had minimal effects. It was also found that interconnection is substantially cheaper than pumped hydro storage. The base-case in the study assumes a CO2 price of €20/ton which is fairly representative of the scientifically calculated social cost of carbon. However, the CO2 price has the potential to vary greatly over coming decades and therefore deserves some detailed investigation. As shown below, the effect of CO2 price on the optimal share of intermittent renewables is highly counter-intuitive. Under the assumption that onshore wind costs fall by 30% and solar PV costs fall by 60%, the optimal share of intermittent renewables rises to about 25% at a CO2 price of €40/ton and falls thereafter. The trend in the above figure is the result of solar and wind being displaced by the baseload low-carbon technologies of nuclear and CCS. At high CO2 prices, these baseload technologies become cheaper than renewables balanced by unabated thermal powerplants. It should be noted, however, that only baseload lignite with CCS was modelled in the study and the picture could look better for intermittent renewables if gas+CCS or even hard coal+CCS was considered. The study also looked at the effect of societal resistance to nuclear and CCS. As shown below, the optimal share of wind and solar would increase greatly if no nuclear or CCS was deployed under a scenario with a €100/ton price on CO2. Taking this option will have some severe consequences though. Firstly, the electricity cost would increase by a further 15-35% over the already high cost of such a high CO2 price scenario. More importantly though, CO2 emissions would increase by 100-200% over the scenario where all low-carbon technologies are deployed. This is the scenario that opponents of renewable energy technology-forcing are most concerned about. Three alternative fuel price scenarios were considered: a doubling of coal prices, a doubling of gas prices and a European shale gas boom similar to that of the US. 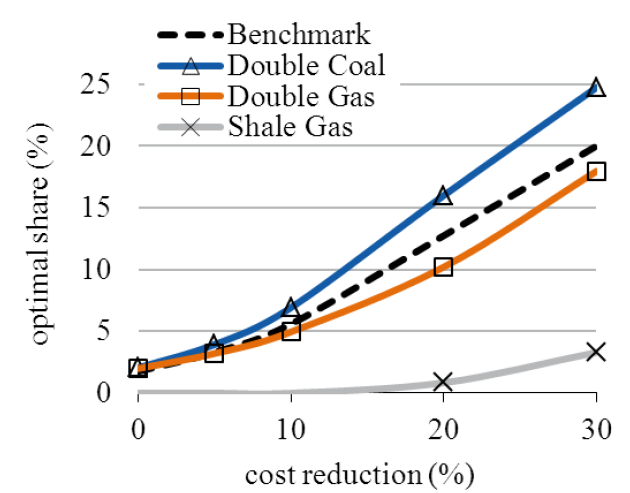 As shown below, a doubling of the coal price gives the expected (although fairly small) increase in optimal wind penetration, while both gas price scenarios result in reduced optimal wind deployment. The shale gas scenario is self-explanatory, but the double gas price scenario requires some further explanation. Although a higher gas price would make wind more competitive against gas, it would also cause a shift from gas to coal as is currently happening in Germany. Balancing intermittent wind with coal is more expensive than balancing with gas, thus leading to the counter-intuitive reduction in the optimal wind share with increased gas prices. The optimal wind share after a 30% cost reduction from today’s levels is shown below for all the scenarios considered in the paper. Most of the scenarios fall in a fairly narrow range. The four outlier scenarios can be briefly discussed in a little more detail. Firstly, the high optimal wind scenario with a high CO2 price and no deployment of nuclear and CCS will be highly undesirable from a climate viewpoint and should hopefully be avoided. The scenario where thermal plant investment costs increase by 50% and wind power investment costs decrease by 30% also returns a substantially higher optimal share of wind. However, since investment costs are most influenced by raw material costs, this scenario where wind and thermal plant costs diverge so sharply appears unlikely. On the other side of the spectrum, we should all hope that the €0/ton CO2 price scenario is just a theoretical scenario that will not persist in the long-term. The shale gas scenario, however, is possible within the timeframes of these results (beyond 2030) and should not be discounted. The paper states that the different model simplifications should add up to a moderate downwards bias on the estimated optimal share of intermittent renewables, implying that these results can be read as conservative estimates. To balance this perceived bias, the study considers optimistic price reductions of 30% for wind and 60% for solar. According to forecasts from Fraunhofer, onshore wind costs will stay essentially constant between now and 2030, while solar PV costs will drop by about 30%. 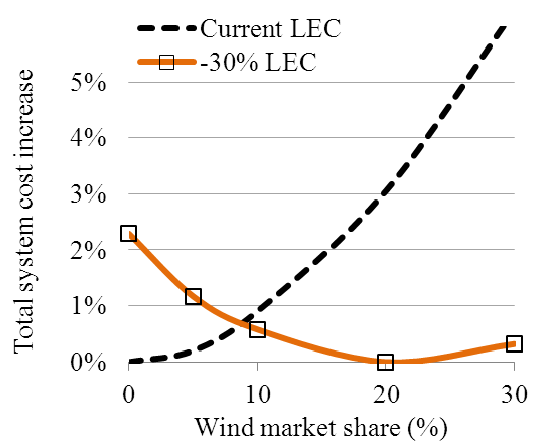 At current costs for onshore wind, the study finds that the optimal long-term share of wind drops from 20% to 2%. It should be noted, however, that the total system costs will only increase by 6% if onshore wind deployment is lifted to 30% at current technology costs (below), thus confirming onshore wind as an attractive technology in north-west Europe under an environment with an accurate price on CO2. However, onshore wind will probably be hampered by other forms of resistance long before it reaches 30% penetration. The optimal solar PV deployment will drop from 2% to 0% if costs only drop by 30% as opposed to the 60% assumed in this study, thus confirming solar PV as a fundamentally unattractive technology at latitudes above ~40 degrees where solar resource quality is low and, more importantly, seasonal variations are large and misaligned with seasonal demand. 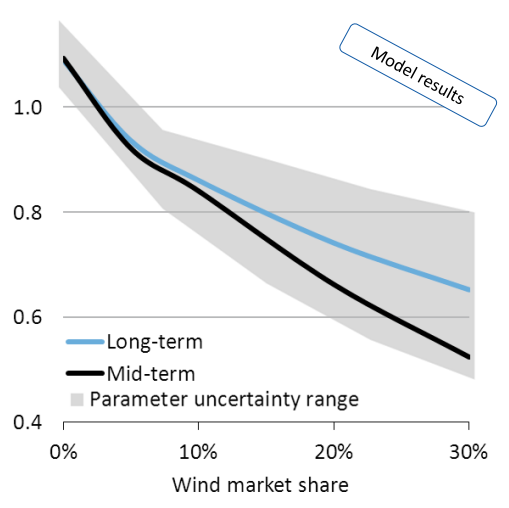 In the medium-term, when taking into account the sunk investments in existing power infrastructure (especially nuclear), the optimal wind share drops from 20% to 7% (assuming 30% cost reduction), thus emphasizing the degree to which intermittent wind depends on thermal backup. Power infrastructure investments will therefore have to be planned very carefully if Europe wants to move towards a high-penetration wind future. Fabulous work. I’ve been waiting to see a study like this for a long time. Thanks for pointing it out, Schalk. I’m almost certainly missing something, but should there not be a maintenance, decomissioning, and replacement cost for some of the windmills between now and 2030? The focus is strictly on the intermittency aspect? I’ll second what Keith said; great study and presentation of it. Thanks. As an editorial note, some of the charts confused me at first. On a quick initial read, I missed the fact that the “cost reduction” on the x-axis referred to the assumed cost reduction in the cost of wind energy. Once I understood that, however, it all made sense. Among the plausible scenarios not considered, I’d like to have seen the effects of storage cost and capacities beyond the limited pumped hydroelectric considered. If sufficiently cheap storage capacity can be developed, then it becomes attractive to use it instead of dispatched thermal generation for backing intermittency. Storelectric in the UK has plans for that, based on CAES in available salt caverns. See http://www.storelectric.com. Another significant parameter would be load-based regulation and significant discretionary loads beyong energy storage. I’m thinking in particular of industrial electrolysis for production of synthetic fuels. It could be shut down for weeks at a time in the event of long low-wind or low solar periods. That would avoid the need to maintain rarely utilized dispatched thermal capacity for cases in which storage was depleted. Oh, and while I’m at it, one more addition for my wish list: the effects of a 3x gain in CF for solar, as a result of placing the panels on floating high-altitude platforms in the stratosphere. They’d be well above clouds, wind, and weather, with 30% stronger sunlight. See http://www.stratosolar.com. This paper has lots of great analysis on renewable energy valuations. It says that if wind power were constant, the optimal share would be 60%. I guess this would apply to geothermal (if it were scalable), and to a lesser extent nuclear. The optimal nuclear share (if it were popular) should be higher, since it’s capacity factor is high (~ 97%) during the seasonal maximum demand, and falls off to around 80% (due to refueling outages) in the spring and fall. As far as solar and wind power valuation, it does not support the common claim that solar energy is much more valuable than average, due to demand correlation (at least in Europe). At low penetration, it values wind at €71/MWh, and solar only slightly higher at €75/MWh. It specifically dismisses the notion of consumer price “grid parity” as being wrong. (I would expect solar power to have greater value in the southern US, with its demand peak in the summer). 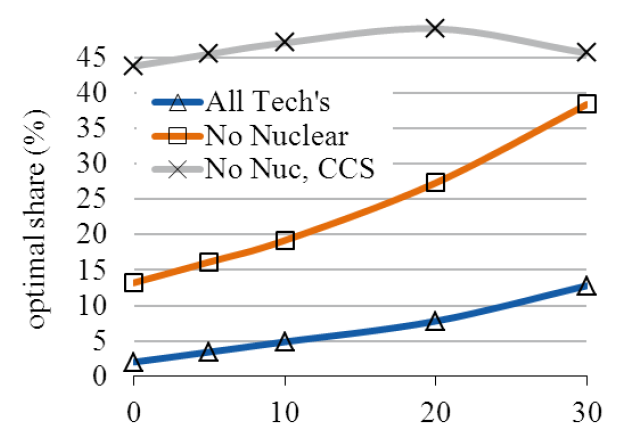 The study repeats the notion that nuclear stands in the way of solar and growth, but it also states that the variability of solar and wind will limit them to smaller deployments than commonly stated policy goals. It is unstated, but nonetheless clear that the same breakthroughs that allow high solar and wind penetration (i.e. cheap storage and/or dispatchable fuel synthesis) will also allow solar and wind to coexist with a strong nuclear portfolio component. CAES (compressed air energy storage) is a technology which has been made obsolete by modern combined cycle gas plants. When air is compressed for CAES, most of the work done during compression shows up as heat, which is discarded by the intercoolers before injection into the cavern. The air must be re-heated with fossil gas when it is discharged from the cavern before it can be expanded through a turbine. The apparent round trip energy efficiency of CAES depends on how one values the fossil gas used. When the first generation of CAES plants were built, fossil gas was commonly burned in a 30% efficient boiler plant which used much more gas than CAES for a given amount of energy output. Nowadays, gas is burned in 60% efficient combined cyle plants, which use only slightly more gas than CAES, and don’t require any electricity input. The effective roundtrip electrical efficiency is only about 40%, hence no CAES has been built in 20 years. I believe there are only two CAES plants in the world: Hundorf, Germany from 1978, and McIntosh, Alabama from 1991. The proposed Iowa Stored Energy Park was never built. Glad you found this study useful. It certainly presents the data in a very elegant and useful manner. The long-term timeframe only implies that the capital stock in the electricity system is completely flexible. In other words, when optimising the generation mix, the model can choose any combination of thermal, nuclear and renewables without worrying about sunk investments. Naturally, this assumption is only valid in the long-term (beyond 2030) because the composition of our current electricity generation capital can only be changed slowly. As pointed out towards the end of the article, the optimal wind share is much lower if current sunk investments are accounted for (the mid-term case). The study works with the levelized cost of wind power, so it should at leas include maintenance (I’m not sure about decomissioning). Glad the graphs eventually made sense to you. About the storage issue, I think it is important to distinguish between the very different needs of wind and solar PV. Wind intermittency typically occurs on much longer timescales than solar and is also more irregular. This makes wind much less suited to traditional ideas of energy storage than solar PV. For north-west Europe, this is the main reason why storage had a very small effect on the optimal share of intermittent renewables. In hot regions where solar insolation is high and well aligned with seasonal demand, storage can be very beneficial, at least to time-shift the solar peak to cover the afternoon/evening demand peak. In this way, maximum value can be derived from a relatively small amount of storage that is utilized at a high capacity. For the much longer and irregular timescales of wind, however, the economics of storage quickly break down. For higher penetration wind energy futures, we have two problems: the troughs (which can be close to zero generation even for large interconnected grids with many wind farms) and the peaks (which can be substantially greater than the total demand). I agree that synfuels could potentially be a good answer to the peaks. However, the economics of this depends heavily on the capital investment costs because such plants will inevitably feature a low level of capital utilization as they wait for the low-to-negative power prices created by occational wind energy spikes. For the troughs, on the other hand, I can’t see any practically feasible alternatives other than thermal/hydro backup. The stratosolar proposition looks interesting, but I’ll only believe it when I see it. At negligible penetrations, the paper finds solar PV to be worth about 30% more than wholesale prices with a very rapid reduction in value thereafter. This is re-emphasized by this paper from the same author which contains a section about very high cost reductions. It states that, even if solar PV costs fall by a full order of magnitude, optimal mid-term penetration in north-west Europe would only be about 17%. By extrapolation, the optimal penetration if solar PV was totally free would only be around 22%. This implies that, after 22% penetration, solar PV actually has a negative value. However, I agree that this picture could change quite dramatically for regions with excellent solar insolation that is well aligned with seasonal demand. It would be very interesting if this methodology was also applied to a power system in such a region. Yes, the incompatibility between nuclear and renewables will be a very important feature in our electricity future. As shown in the article, a lot of this depends on the price of carbon. Moderate carbon prices tend to favour wind with fossil backup, while high carbon prices favour nuclear. Unwittingly, nations pursuing agressive renewable energy technology-forcing policies are therefore betting on only moderate climate impacts. If climate science eventually turns out to be right, these nations will find themselves in a uncompetitive position agaist nations that bet on nuclear. You’re right that there are (still) only the two big hybrid CAES plants in operation. There are, however, a couple of others under construction, and many more under planning. All will have efficiencies substantially higher than the McIntosh plant — which itself is more efficient than the older Hundorf plant. It’s worth noting that the McIntosh plant was optimized for ancillary services and responsive generation, not energy storage. It’s possible to do significantly better in a design optimized for energy storage. There are substantial exergy losses in the intercoolers between the four compressor stages of the McIntosh facility. Those are avoided in newer designs that employ either quasi-isothermal compression or adiabatic compression with thermal storage. Both processes are nearly isentropic. If you want to know more, one starting point is a recent thesis by a Canadian Phd student at Windsor University. It can be found at http://scholar.uwindsor.ca/cgi/viewcontent.cgi?article=1193&context=etd, and has many references to older but still relevant work. Bottom line: advanced CAES is definitely not obsolete. There are at least three different strategies that could be followed for electrolysis process in a sunfuel plant: low, medium, and high duty cycles on the electrolyzers. If the electrolyzers are cheap enough — and there are some prospects for that in new electrodes and catalysts that have recently been developed — then it’s feasible to operate them at low CF. They become “bottom feeders” that take power when there is a surplus and it’s super cheap. That’s the approach advocated by David and Glen Doty (dotyenergy.com) for their “Windfuels” concept. It also seems to be what you’re thinking of. The high CF approach consumes scheduled baseload capacity in industrial blocks. The rate is higher than the scavenger rates for the low CF approach, but lower than retail and much lower than peak. The CF can be near 100%, but operation can be curtailed during power emergencies with little consequence. That’s the approach I was thinking of for long periods of wind outage. The medium CF approach allows the grid operator to control the electrolysis banks in real time. They become a resource for load balancing and regulation. The banks aren’t limited to ON / OFF, but can be throttled from full on to full off or anwhere in between in just miliseconds. Pricing the electricity consumed, in that case, is a bit problematic — something for the regulatory commissions to sort out, I would imagine. The electrolysis banks aren’t just consuming electricity, but are providing valuble service to the grid operator for which compensation is appropriate. For the medium CF strategy to pay, the discretionary capacity needs to be large enough to enable decomissioning of at least some coal and gas power plants that would otherwise need to be kept on standby for periods of high demand or low supply. Thanks for this interesting summary, Roger. Do you perhaps have any credible numbers about the current and future economics of such ventures (i.e., $/gal of gasoline equivalent)? It would be nice to just get a rough estimate of how far such ideas are from economic viability. Another important issue which is ignored in the paper is the effect that baseload power has on longterm wholesale electricity prices. It only really discusses prices in the context of sub-optimal towards too much wind (fig 21). What about sub-optimal towards too much coal or nuclear? His optimization criteria is based on Levelize Electrical Cost (LEC), which is inherently a short/medium term metric. Due to the discount factor (which is not stated), the LEC equation effectively ignores energy and costs which occur 30-40 years in the future. Hence coal and nuclear (which have high up-front cost but low operating cost, as well as 60 year service lives) will produce much lower long term electrical cost than wind farms or gas plants with the same LEC. Future costs for nuclear would also have to consider a realistic “learning effect”. The observed negative learning effect (costs rising with experience) can only rationally be attributed to “first of a kind” effects and falling costs with experience must be inevitable. The important negative implications of fossil gas as an imported fuel are also ignored. This is easily observed in Germany, which is maintaining a significant coal-fired generation share, in spite of the claim in the paper than wind and solar work better with fossil gas than coal. Yes, plant lifetime and financing costs become very important variables when talking about capital intensive technologies like nuclear and wind/solar. You can have a look in this paper by the same author for a little more info. Table 6 has some info on cost assumptions. It also states that plant lifetimes of 50 years are assumed for nuclear and 25 years for all other plants. This is probably a bit unfair towards other thermal plants and perhaps also solar PV while being a little generous towards wind. The last figure in the above-linked paper gives the screening curves of levelized costs in terms of €/kW/yr as a function of capacity factor. When back-calculating from this figure, it appears as if a rather high discount rate of about 11% was used. Yes, one should probably also consider possibilities of reduced costs for nuclear (and also second generation CCS). The paper reported on in this article only considers one scenario where plant capital costs increase by 50% which led to a significant increase in the optimal share of wind power. It is probably safe to assume that a decrease in the nuclear capital costs would likewise reduce the optimal share of wind. As I understand it, Hirth’s work calculates the welfare-optimal deployment of wind/solar by finding the intersection of the marginal cost and marginal benefit curves (in terms of €/MWh) as a function of deployment. For example, if we assume fixed wind investment and financing costs, marginal costs for wind will go up with increasing deployment (as we run out of windy locations) and marginal benefits will decline (as the intermittency becomes an increasingly important issue). The optmimal deployment point is where these two lines cross and any further deployment would cause costs to exceed benefits. The marginal cost/benefit curves depend on several factors. The most important driver of the cost curve is technological learning, while the CO2 price and the power production mix have large influences on the benefit curve. Large CO2 prices would shift the benefit curve upwards, while more flexible generation would slow the rate of decline with increasing deployment. I therefore think the approaches are similar – trying to find the generation mix that is of most value to society. 1. The attractiveness of intermittent renewables deteriorates rapidly with increasing penetration. For example, doubling electricity from solar PV from about 13% of total supply in the 33% RPS scenario to about 26% of total supply in the 50% RPS large solar scenario increases the marginal curtailment (the percentage of the next added MWh of solar PV that must be curtailed) from 5% to a massive 65%. 2. High penetration renewable energy futures can be achieved if people are willing to pay for it. Inflation adjusted electricity prices will roughly double up to 2030 and 50% renewables, although less than half of this is attributed to renewable energy technology-forcing. 3. Utility scale solar is more economical than distributed solar and much more economical than rooftop solar. This is fairly obvious, but against the wishes of many renewable energy advocates. 4. Integration measures can marginally reduce the cost of higher penetration renewable energy futures, but offer no miracle solution. A more balanced renewable energy portfolio and increased trade seem to be the best measures, while storage does not result in significant cost savings. 5. Renewable energy technology forcing remains the least cost-effective climate change mitigation measure. CO2 abatement costs of increasing renewables from 33% to 50% range from $403/ton to $637/ton which is 1-2 orders of magnitude higher than most other mechanisms. If you are as concerned about climate change as I am, numbers like these are highly alarming. 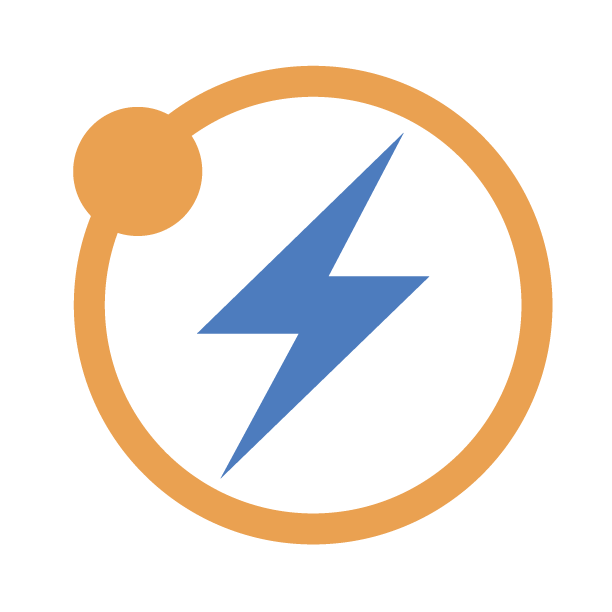 – 50 kWh per kg of H2. Theoretical minimum for electrolysis at ambient temperature, I believe, is something like 42 kWh. Electrolysis is endothermic, and some of the energy for water splitting is thermal. So at higher temperatures, the electrical energy that must be supplied is lower. But it’s not a large effect until you get up to unmanageably high temperatures. I believe for steam electrolysis at several hundred degrees C, it still takes around 35 kWh per kg of H2. Steam electrolysis is not yet a mature technology; the ceramic membranes required are expensive and not all that durable. Bottom line: 50 kWh per kg is a fairly solid number going forward. Some room for improvement, but not a lot, and no prospect for any dramatic improvement. – 1 kg H2 is rough energy equivalent of 1 (US?) gallon of gasoline. If electricity is a not-unrealistic $0.10 / kWh, the lure of $0.50 / gallon equivalent was the impetus behind the push for hydrogen FCVs. But that didn’t account for the high capital cost of equipment, the relatively short lifetimes for PEM fuel cells, and the intractable problem of storing several kg of H2 in a passenger car. – Capital cost for electrolysis equipment: ~$1000 / kW off the shelf for small commercial installations; perhaps $750 / kW off the shelf for larger industrial applications; $500 / kW a speculative but probably achievable target for installations with current technology, but on a scale large enough to justify upgrades and expansion of designs and manufacturing lines. That scale would need to start at 10’s of MW capacity per year, ramping to 100’s of MW per year to justify the manufacturing investment; $350 / kW a more agressive target for what’s acheivable under the preceding scenario, using moderately conservative assumptions about next generation electrodes and catalysts instead of current technology; $250 / kW or even less, if some of the newest lab developments pan out and are able to scale to industrial levels. Caveat: I came up with those numbers several years ago; things could have changed since then, but I doubt they have changed by much. – Amortization and discount rate: apply whatever seems appropriate for the current banking and investment environment to the capital costs cited above for the cost of capital. Electrolysis equipment and the reaction vessels used in subsequent synthesis should be pretty durable; a 30-year lifetime for amortization is probably not unreasonable. – Synthesis costs: the energy costs for synthesis have mostly been already paid in producing the H2; the subsequent synthesis reactions are energetically downhill from there. For synthetic fuels, the synthesized product is likely to embody somewhere from 30% to 70% of the energy that was present in the H2 input. It will depend on the choice of target product, and tradeoffs made between capital costs of heat exchangers and other equipment in the synthesis train and production efficiency. The simplest and probably most efficient case is methanol. It would be close to the 70% high end for efficiency. – Duty cycle for synthesis train: can be close to 100%. With moderate H2 buffer storage, operation of the synthesis train can be largely decoupled from operation of the electrolysis bank. So intermittent operation of H2 production on the timescale of fractional days is not a major economic factor for the cost of synthesis. – As a real-world benchmark, the George Olah Renewabl Methanol plant in Iceland is able to produce methanol from CO2 and H2 that competes with methanol from natural gas. The latter currently sells for something in the vicinity of $1.00 per US gallon. The Olah plant benefits from cheap electricity from Iceland’s geothermal resources and concentrated CO2 from a volcanic vent. It would be interesting to see how the results would change when applied to wind power with capacity factors in excess of 50% as are available in the central great plains states of the US. Currently PPAs are fetching about $30 / MWhr with the 37% average capacity factor that is forced due to poor transmission resources. After factoring in subsidies and accounting for the Euro to $ conversion rate our power from wind is less expensive. Then add the additional 13% to 15% capacity factor and it becomes less expensive still and more steady. I looked but could not find any metion of the CF typical in Europe but I would be surprised if they are even at 37%, let alone the 50% level that is available in a number of the Great Plains states. Yes, I would also love to see other studies employing this methodology completed for other regions of the world. The US would certainly be a good place to start. As you know, I like high capacity factor onshore wind, but one still has to be objective about the cost. Average project installation costs in the central US amount to about $1800/kW. 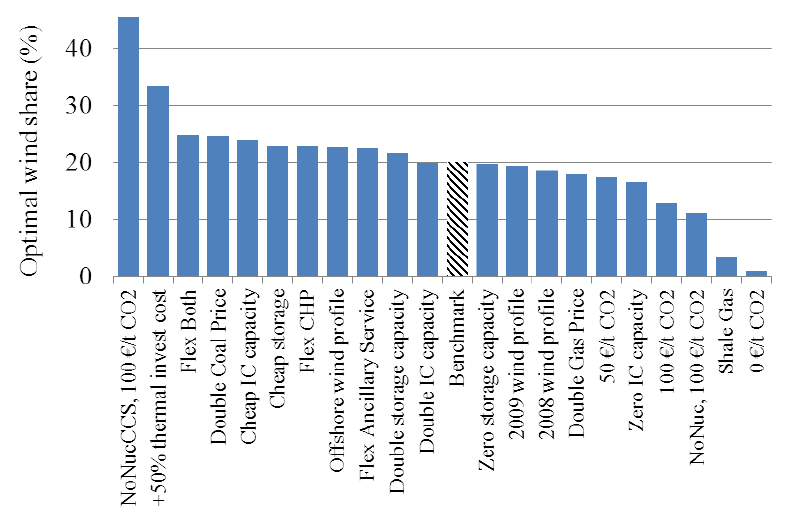 The LCOE derived from this capital cost assuming a 40% CF, 10% CoC and a 20 year lifetime is $59/MWh. Throwing in $10/MWh O&M brings the total up to $69/MWh. The large difference between this number and PPA’s reflects the influence of subsidies. Yes, it’s all about “meeting the demand curve” as much as possible, before jumping to storage solutions. I think that you are painting a worst case scenario. Current PPAs in that area are fetching about $30 / MWhr and the production tax credit is $22 / MWhr putting it at just over $50 / MWhr. Correct me if I am wrong but I think other incentives are about on par with those granted to other energy sources so should not be included in a comparision. The current average Capacity Factor (CF) in the central US is about 37%. However there are large areas with wind resource to provide a CF of >50% for 100’s of GW nameplate. Also, if meaningful amounts of wind were installed the cost for the turbines and delivery costs would come down. Maintenance costs for turbines have been on a downward trend and labor and COL in that area is quite low. Finally for any meaningful amount of energy to be generated then it would have to find its way to the east coast which would add another $20 – $30 / MWhr to its value. Finally, for any meaningful amount of wind power to be built there would have to be a carbon tax or some other playing field equalizer. These factors combined reopen the question of whether or not to put in the transmission needed to get it to market. The Hirth 2012 paper has an interesting point in fig 22. It shows that forcing wind power in to the French power system has the longterm effect of replacing some of the displaced nuclear power with coal (as well as supressing pumped-hydro)! What could be a more clearcut example of wind power as a very bad choice environmentally? Table 6 has the very strange datapoint that Lignite power has a variable cost of only €0.001/kWh (half that of nuclear, and less than its fuel cost). What’s going on there? My comment specifically referenced the great plains states. The current average capacity factor for EXISTING turbines in the central great plains states is 37%. 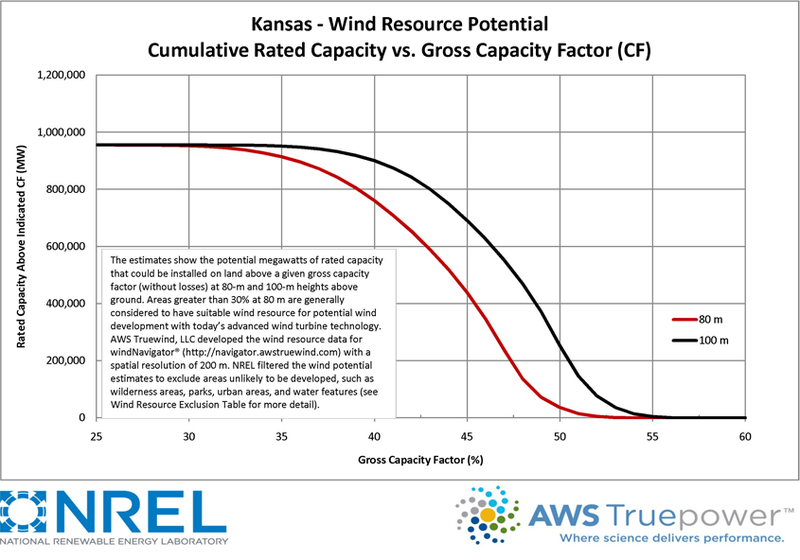 However there is over 200GW of opportunity at above 50% CF in Kansas and nearly 300GW in Nebraska. The high wind areas are geographically compact and there is a great deal of land available for development. And because they are geograpically compact that reduces the complexity and expense of tranmission lines from the wind farms to the primary high capacity transmission line. You have done projections using the 37% capacity factor as your planning number to build an agument against increased transmission out to the central great plains. It would appear that your idea would be to build new transmission out to poor sites. My suggestion is that if the country builds new transmission resources for the purpose of harvesting the world class central region wind resource, that we build it to the good sites with 50% and higher capacity factor. It is unlikely that we could have high capacity HVDC power transmission lines built out in less than 10 years. So that means that much of the significant turbine deployment would begin 10 years from now and likely continue for at least 10 more years. What will the state of the art turbine be 10 years out, and 20? Apparently your idea is that we will still be building 80 meter wind turbines in some of the worlds best sites. Given that there are commercially available turbines up to 135 meter hub heights TODAY, my projections use hub heights no less than 100 meters and that would represent the absolute minimum. I do not understand how use of 80 m hub heights makes any sense for projections using turbines to be deployed 10 – 20 years from now. Hub heights and capacity factors have continued to increase since the 1980’s. Hub heights nearly doubled in the last 10 years. A realistic, and probably conservative, scenario would include no turbines less than 100m hub height and a significant fraction of turbines in the 150m hub height range. At that height CFs in the best areas will be 55% or greater. That is 50% higher than the estimates you are using. You have repeatedly called into question the NREL numbers so I guess I have you to thank for motivating me to scrutinize them. There are a number of existing wind farms that are producing at or near 50% CF today. They are in areas that are not optimal on the NREL / AWS maps. This suggests to me that the areas that show up as being optimal sites actually are. In other words, the data is consistent with the NREL claims. And if their claims are correct then there are sites that can support hundreds of GW at 50% CF and above. I’m very skeptical of any claim to a capacity factor of 50% or more for any land-based wind turbines. Even the best offshore sites only claim 40%, and those claims are somewhat dubious. Power output goes as the cube of wind speed, so if the wind is blowing at 2/3 of the maximum for which the turbine is rated, power output will be 8/27, or 30% of its rated maximum. Winds — especially over land — are just not that steady. I suspect that the 50% “CF” you’re talking about is rather an “OF” — operational factor. I.e., the turbine is operating, and producing SOME level of output, 50% of the time or more. That I could believe. Of course, if a high CF claim is the basis of sales, the CF can be artificially boosted by simply claiming a low nameplate rating over what the turbine could actually deliver. E.g, design it to achieve its nameplate rating at a wind speed of just 5 mps, say, and throw away anything above the rated output whenever the wind is blowing faster. That would be stupid, since it’s megawatt-hours delivered per year that matter, but it would sure make the CF look good. I understand your skepticism, it is a rather remarkable thing which I also approached with initial skepticism. On page 48 of the DOE report that Willem linked to in an earlier comment, there is a graph that indicates that there are a number of wind farms with capacity factors above 45% and one above 50%. This is data rather than projections or simulations. I have no reason to think that the DOE would make up data of this sort. NREL has proivded a database of windspeeds around the country which I used for my broader conclusions. Those are built from simulation models. As I said in my post, it appears that they are consistent with the data mentioned above. I have submitted a post to theEnergyCollective examines where the good sites are based upon the NREL data. I have another one that I hope they will post that looks at capacity factors in the central great plains. I have some anecdotal evidence that also is consistent with the idea of very high capacity factors. 1) I develop and sell environmental monitoring systems most of which include industrial grade anemometers. We have systems that have been operational throughout the Northeast. I do not recall a single anemometer failure from wear. I had occasion to speak with someone who did wind resource studies in the great plains. He said that they had 6 anemometers on the towers, a pair at each of three heights. They were the same anemometers that we use. He said that they replace, on average, two per year due to wear. 2) I have a friend who grew up in South Dakota. When he told me that I mentioned that his state had enormous potential as a provider of wind power. He laughed and said he was not surprised. He indicated that the wind seemed never to stop, that it was relentless and that there was always dusty grit everywhere. Wind was everpresent. Finally, I am very confident that the 50% does not refer to the OF. Here is a typical power curve, notice that there is a pretty wide range of wind speeds at which it operates at peak power. Also notice that it produces some power down to well below 9 m/s, the average wind speed at the high CF regions I mentioned. Sorry, but the typical power curves that you referenced above don’t support claims of a high CF. The red lines show the power coefficient, Cp, as a function of wind speed. It peaks just above 50% for some of the turbine models shown, and a little under 50% for others. Cp is the ratio of power produced to the kinetic power of the wind passing through the swept area. It has a theoretical upper limit of 57% — the Betz limit. A Cp of 50% means that the turbine is delivering 85% of what it could theoretically deliver — which qualifies as a very good design. But it says nothing about CF. CF is determined mostly be wind speed distribution at a specific site. Not just how much of the time the wind blows, but how steadily it blows. Roger, the last two sentences of my comment addressed your comment about operational factor (OF) not CF. Again, I suggest you look at page 48 of the DOE report that I linked to in the earlier comment. It has data from operating wind farms showing capacity factors that range from 45% to 51%. To resolve this, one needs only to scroll up one page to Fig. 30 in the above referenced report. Here, the reason for high capacity factors is clearly illustrated as a tradeoff for a lower specific power (the power rating over the swept area). Decreasing this ratio means that larger turbines are used to deliver a given maximum power output and a substantial portion of the power that could potentially be extracted at high wind speeds is discarded. This is obviously a trade-off exercise between high output per $ invested and high resource quality (CF). As shown in the referenced figure, the red line has by far the highest sample size (an order of magnitude larger than the blue and green lines) and should therefore be the most representative of the optimum in this trade-off exercise. This line gives a CF of 37% in very windy locations. The few examples upper end of the CF spectrum most likely have a low specific power that lies below the economic optimum. Naturally, one could further decrease the specific power to increase the CF, but this would rapidly deteriorate wind turbine economics. As I understand it, the $23/MWh PTC is actually worth about $30/MWh before tax and this is the value that should be used in this comparison. Another factor might be lower cost financing facilitated by artificial risk reduction through loan guarantees and accommodative policy. Yes, the US will have to be very sure about a future in wind before the very large transmission investments necessary to turn a high-wind future into a reality are made. The pure complexity of this foundational decision could leave lawmakers and lobby groups gridlocked for many years or even decades. Yes, the danger of excessive technology-forcing of intermittent renewables leading to much greater emissions is a major theme which I tried to convey in this article. Low-penetration wind/solar can be beneficial (if it is done in the right regions), but if accommodative policy pushes this too far, it will end up doing much more harm than good. I don’t think the difference between €1/MWh and €2/MWh for variable operating costs of lignite and nuclear is of much concern in a study with this level of uncertainty. But when comparing with data in the OpenEI database, it appears as if the slightly higher variable operating costs of nuclear could have been traded for slightly lower fixed operating costs. The boundaries between fixed and variable operating costs can sometimes be a little blurred. I agree with you that the challenges brought by intermittent renewables are certainly very complex, but I also think that we require projections several decades into the future. If we limit our horizon to short-term extrapolation of historical data, I am pretty sure the slow journey away from fossil fuels will be end up to be highly inefficient. At the same time, I also agree with you about the dangers of such studies. For example, if the negative effects of intermittency at higher penetrations are not accurately represented, the conclusions can steer us in the wrong direction. However, I think that models are increasing in reliability significantly faster than wind and solar are deployed, implying that longer-term projections should eventually evolve into a fairly trustworthy roadmap for the decarbonization of the global economy. Another impact of renewable power. I partially agree. It would be nice if they had a way to see what the tower heights were for the lower specific power turbines. The report also says that the CF increase has stalled in part because there is no transmission access to the best sites. One need only look at the 100 meter resource maps recently put out by NREL that this is the case. Most of the installations have gone in in MN, TX and IA. The MN and IA sites just cannot compare to what is available in KS and NE. The TX resource is a mixed bag. In any event as towers get higher so does the CF for a given specific energy and the state of the art is now 135m (none of which has been deploy. So, one can argue whether we will max out at 45%, 50% or 55% but 37% is unrealistically low in the event that the country decides to make a real effort to cut carbon using renewables. Do you think that we have maxed out at 37% or do you think that in the 10 – 20 year time horizons that would be required to build out transmission lines that the CFs will go higher. If so, what is the number that you think is reasonable? Clayton, about the maximum achievable capacity factor in the central US, I think the current economic optimum might lie somewhere around 37%. Of course one can increase the CF by making larger structures (taller towers and/or longer blades) relative to the maximum power output of the turbine, but this would quickly become uneconomical. This economic optimum can of course change over time. For example, if manufacturers find lighter, stronger and cheaper materials to construct turbines, the turbine oversizing costs in pursuit of higher CF’s would become smaller and the economic optimum CF would shift upwards. More importantly, if the costs of intermittency were to be properly internalized, high CF will become a greater priority relative to total power output per $ invested and the economic optimum would also shift upwards. So yes, I am pretty sure that the maximum CF of onshore wind will shift upwards over coming years, but the oversizing necessary to achieve this will also hamper competitiveness. WFIW, the same inherent problem plagues efforts to harness ocean wave energy. Under conditions that prevail 90% of the time, the wave energy density available is modest but usable. But if you design a wave energy device to operate economically under those conditions, it will likely be destroyed during those times when the wave energy density rises to 100x its typical level. At best, you might design it to survive those high wave conditions, but it would be unable to tap the huge amount of energy that is available under those conditions. Schalk is right that a wind turbine can be designed to achieve a high CF, but it requires a large turbine with a low power rating. It’s not generally economical. The turbine can deliver its rated power at low wind speeds, but it will not be able to tap most of the much larger power level that is available at higher wind speeds. Actually, there is a design approach where a high CF, low power density approach could become economical. That’s an ultra lightweight design using “smart” warping blades that would dynamically adapt to instantaneous wind speeds encountered at different points within the swept disk. They would be flimsy by current standards. While spinning, tension from centrifugal force and the blades’ ability to control their angle of attack to the wind stream would stabilize them. The trick would be starting and stopping — like takeoff and landing of an airplane. Nice to see some real data posted. Thanks Willem. The limited effectiveness of wind in reducing carbon emissions really shouldn’t surprise anyone, given that the fossil-fueled units that are least impacted by reduced duty cycles and frequent starts and stops are the least expensive units with typically lower thermal efficiencies — particularly when starting up or shutting down. I think it’s important to recognize, however, that this is an economic issue. It’s not a hard technical issue. It derives in part from the failure to burden fossil fuels with the external costs of carbon emissions, and in part from our reluctance to invest in the alternative resources needed for cleanly backing intermittent resources. The plants that are being frequently started up and shut down or operated below their optimum power bands already exist. They can’t be decomissioned unless / until alternative systems are implemented with the capacity to ride out prolonged periods of under-delivery from intermittent resources. Those alternatives systems would be some combination of high capacity energy storage systems and discretionary loads that can be shut down for extended periods when needed. Suitable storage systems would likely be some form of gravity power or CAES. Suitable discretionary loads would be electrolysis banks for fuel synthesis or other chemical needs. The real problem is that renewable energy advocates fool themselves about the true costs of carbon emissions. And politicians are happy to pass measures that bestow a mantle of green consciousness without the pain of what would atually be needed to make those policies work. I’m not sure if you actually read the article, but the results reported here show that the welfare optimized long-term share of onshore wind in north-west Europe is about 20% – about the same as the (relatively old) study you reference. This long-term optimum assumes complete flexibility of the grid, so the CHP constraint is removed. In his other papers about the medium-term case, the author also discusses the inflexibility of CHP plants and identifies this as a highly influential parameter (see section 5.6 in this study for example). If you have any authorotative studies about the economics of gas-CHP plants with large-scale storage, please let me know. As stated in the article, I see onshore wind as a good resource in north-west Europe up to moderate levels of penetration (around 25% electric or 10% total energy in the very long term). I was therefore surprized by Germany’s decision to limit yearly onshore wind installations to 2.5 GW – a rate which will make German wind plateau at about 50 GW installed capacity – only about 50% more than currently installed. At currently achieved capacity factors, this would result in about 72 TWh/a of generation (about 12% of total electricity generation). For my opinion on subsidies and externalities, please see this article. I doubt we will ever see anything like that in commercial operation. Wind turbine lifetime is already very short because of enormous stresses on the blade, and adding moving parts and less strength just makes a bad problem worse. Maybe, maybe not. The stresses on large turbine blades are enormous precisely because the blades lack supple control in their angle of attack. An adaptive blade would be technologically advanced, but it would likely not have complex moving parts. It would more likely depend on elastomers and synthetic “muscles” to achieve smooth warping. But for now, I’d have to agree that they’re science fiction. In contrast, we can look to France to see what an electrical grid looks like with 80% nuclear. It works fine, CO2 emissions are very low, and cost are low. The renewable path entails much higher risk to the economy and to the environment compared to nuclear than is generally acknowledged; it is dependent on too many breakthroughs. Thank you for stating the employer of this scientist. That explains his somewhat strange results that do not fit with those by the Energiewende institutes (Agora, Fraunhofer). He didn’t include Denmark which has close interconnections with Germany/Netherlands. ~35% of Denmark’s consumed electricity is generated by wind turbines now. They target to have that raised towards >50% in 2020. – nuclear; Vattenfall has substantial nuclear. But new nuclear is off the table in Germany, Belgium and Netherlands (Denmark never had nuclear). The Energiewende studies concluded that the best ratio between wind and solar produced KWh/a is ~60% by wind and ~40% by solar. Furthermore the Energiewende scenario assumes that wind+solar will produce ~40% of German electricity in 2030 (so ~16% by solar, ~24% by wind). I estimate that the share of solar will be bigger than wind in 2030. Because of the lower prices of solar and batteries in 2030. And that wind+solar will indeed produce ~40% of Germany’s electricity in 2030. I don’t think there is too much bias in this study. Complex models such as this one give results which are consistent with the assumptions they use and the assumptions in this study appear to be reasonable. Let me know if you see clearly unreasonable assumptions in the study. I have been in contact with Lion Hirth and can forward any scientific challenges to his modelling work directly to him. About Denmark, I think the interconnections that matter are the ones with Norway and Sweden. The small size of the Danish electricity market (20 times smaller than Germany) and the unique connections with abundant hydropower makes it a very special case that cannot be generalized. The study also never says that higher penetrations of wind/solar are impossible, it just says that these higher penetrations will not be welfare-optimized. Germany can definitely achieve ~40% of their electricity production from wind/solar by 2030. It will just be substantially more expensive than optimized alternatives. The figures on the ideal wind/solar mix in Germany I have seen normally function on the simplistic assumption that wind/solar balance each other on a seasonal scale when deployed in a roughly 1:1 ratio. To me, this is not a very good way to approach the problem because the intermittency of wind/solar is very different in nature. One would therefore need to build two seperate intermittency mitigation strategies in Germany – one for the wind in winter and another for solar in summer. This will be very expensive. Agree that the study never says that higher penetrations are impossible. It just looks for the optimum, the lowest costs. So costs inputs are important. Published in nov. 2013 it assumes for that the costs for solar are €180/MWh (page 18). At that time the FiT for >1MW solar installations was <€100/MWh going down further (~1%/month). With critical assumptions so much off reality, his study indeed seems only intended to assist Vattenfall to continue business as usual. Especially since the real facts regarding those assumptions are so easy to find. He assumes a 60% decrease of solar, which implies €72/MWh. and below €40/MWh level in the 2025-2030 period. So, I think that nearly nobody in Germany will consider that Vattenfall study as a serious study. Especially since it even contradicts sometimes statements made by Agora & Fraunhofer. But the study may be intended for other (less informed) markets where Vattenfall also operates. Germany will soon demonstrate the pros and cons of a rapid technology change from electricity production following the demand to one which is governed by intermittent supply. Table 2. Key data of the electricity system with REs producing exactly the amount of energy corresponding to the demand (“100% case”) under the “optimal-mix” conditions. On the contrary, the 60% solar cost reduction (€72/MWh) is well in line with projections made by Fraunhofer up to 2030 for Germany (other European countries are likely to remain more expensive). Also, the low cost estimations by Fraunhofer are highly dependent on very low financing costs (around 2.6% WACC) which I think misprices financial risk tied to a technology which is heavily dependent on direct subsidization and rapidly cannibalizes itself with increasing penetration. Can you link your source of cost projections to confirm that it is less biased than you assume Vattenfall to be? About your reference to the falling FiT (please correct me if I’m wrong) but from what I understand the economic attractiveness from installing PV in Germany is not due to the FiT received, but rather due to the reduction in required (extremely expensive) electricity purchases from the grid. Thus, as the EEG surcharge (primarily subsidizing PV) continuously pushes up German retail prices, PV systems become increasingly attractive. In this way, higher electricity prices caused by PV subsidization makes PV more attractive – obviously a highly unsustainable situation. These figures are for a dispatchable generating fleet which is not fully optimized especially for intermittent renewables, so it can be improved in the long-term. The point is, however, that the value of PV drops very rapidly with increasing penetration, especially in Germany where it is misalligned with seasonal demand and very “peaky” at the best of times. When PV supplies 10% of total electricity demand in Germany, it will already supply more than 100% of demand on certain sunny days, resulting in negative prices. Agree about the low interest rate, but little prospect that it will rise soon. Yes housholds save expensive (25-29cent/KWh) electricity. So I used the Sept. 10cent/KWh FiT for big solar installations as those are mostly installed by investors. Anyway big consumers pay only a fraction due to exceptions (the EU competition investigation ended in a compromise which allows adapted continuation). Agree about the influence of the low interest rate, but little prospect here that it will rise much. Btw. that FiT decreased to 9cent/KWh now (=11%/a decrease). Below Jens Stubbe already posted: “Fraunhofer institute has been consistently wrong…”. Similar regarding EIA. Somehow such institutes tend to assume changes are near the end. I use the long term price development published in Scientific American: -8%/a. Technology innovations (cheaper, more yield) are now coming faster in this field (= chance for acceleration) due to better understanding of molecule & atom structures (better microscopes, etc). One of the other study shortages is the lack of long term. Germany decided in 2000 for a migration scenario that would take 50 years an would end with “only” 80% renewable. One reason for that long period and limited target was the realization that a 60% share of wind+solar would require a different generation structure for the rest; no place for baseload power plants, only flexible power plants that can regulate production deep down (without major costs). Hence the installation of the new low temperature burning circulating fluïdized bed power plants. Hirth spends only a short paragraph to long term. Fig. 23 p.18 shows that in that situation the optimal share of wind would be ~30% (or more with more cost reductions). But he doesn’t fully study. Similar for solar. Neither the combination. Check figure 33 and 34 (p.38) in this Fraunhofer report (has lot of interesting insight info). It shows that solar and wind complement each other (there is more wind in winter here). With much lower PV costs most consumers (farmers, offices, etc.) will put PV-panels on their roof, even while the FiT is near zero. So German PV capacity will grow towards ~200-400GW (2-5 times German max. consumption). And households will buy batteries as those become fast cheaper. German battery subsidy program is a succes, while the subsidy is only 30% of investment, which implies batteries will become intrinsic part of new rooftop solar within 5 years. This also implies that totally going off the grid (alone, or with your neighbourhood, also installing two wind turbines) will become more interesting. So that perecentage may rise to >10% (in a recent poll ~24% of Germans said they may do that before 2020). So electricty consumption from the grid will go down greatly (only in winter power plants can deliver). A paradigma change. Some call it a disruptive development, which is true for those who loose their job at power plants, etc. Grid management will become more interesting. If those happen more often the 35 German pumped storage facilities may become profitable in the end (somewere in 2025-2030). But seeing those developments investors are now developing electricity-to-(car)fuel/gas plants (e.g. Audi has a 6MW pilot plant). 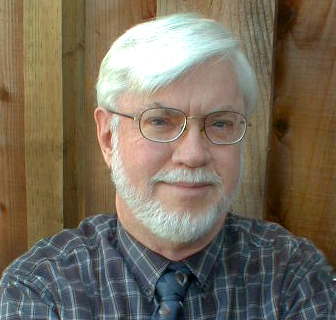 Hirth’s study ingores nearly all those effects. Probably because his framework of thinking is still the present situation, but may be also because it doesn’t suit the main business of his boss Vattenfall. das Szenario B für das Betrachtungsjahr 2033 des von der Bundesnetzagentur genehmigten Netzentwicklungsplans (NEP) Strom 2013 zugrundegelegt. In dem Szenario setzt sich die installierte konventionelle Erzeugungsleistung von 87 GW im Schwerpunkt aus 41 GW Gaskraftwerken und 32 GW Stein- und Braunkohlekraftwerken zusammen. Es sind keine Kernkraftwerke mehr in Betrieb. Die Kapazität von Pumpspeicherkraftwerken wird mit 11 GW angenommen. Bei den erneuerbaren Energien sind im betrachteten Szenario Wind (installierte Leistung onshore: 66 GW; installierte Leistung offshore: 25 GW) und Photovoltaik (installierte Leistung: 65 GW) die dominierenden Erzeugungstechnologien. Price projections for solar power modulles, I believe, are “fragile”. Anything which simply extrapolates the rate of reduction seen over the past 5 to 10 years is very likely wrong. If one tracks spot prices over the last 6 months to a year, one finds that they have actually been rising. Production cost reductions are not automatic. They result from improvement in production facilities — new facilities being built, or older ones being rebuilt with newer equipment. One doesn’t normally build new facilities or spend capital on major plant upgrades in a market that is stagnant or overserved. The spectacular cost reductions in solar modules over the last ten years started from a combination of new technology for production of solar-rated polysilicon and new efficient module production facilities, built mostly in China, in response to market expansion. The latter was mostly due to the very high level of subsidization in Germany. In the latter part of that decade of price reductions, the reductions were not so much a reflection of falling production costs; they were a reflection of a distress in a market that had become overserved. Only the newest, largest, and most efficient Chinese producers were making money at those prices, and their margins were razor thin. The Chinese government jumped in with its own agressive solar power installation program to keep its producers in business after the European market slowed. Over the past year, there has been some consolidation, with less efficient producers allowed to fail. So the remaining producers have been able to raise their margins. Hence the recent prices increases. But there’s not much visible investment in new production capacity or plant upgrades. Maybe it’s there and my friend who tracks these things is just not seeing it. But my personal, non-professional opinion is that those counting on a continuation of rapid price drops are “whistling in the dark”. In fact, if current subsidies are withdrawn too quickly, it’s possible that the market could collapse. The cost reductions have been great, but they haven’t quite reached the point of “walking on their own”. Short term there have been a lot of fluctuations in wholesale module prices. However the underlying costs have followed a remarkably predictable production experience curve. I have been a student of this thing for years and been astonished at how wholesale prices always drop back to the experience curve. Things such as the silicon shortage or aggressive subsidy programs have kicked margins up and it pops up above the curve and then events such as the Chinese manufacturing subsidies will cut margins too tight or even to losses. But overall, on a 5 – 10 year planning horizon this has proven to be very predictive. 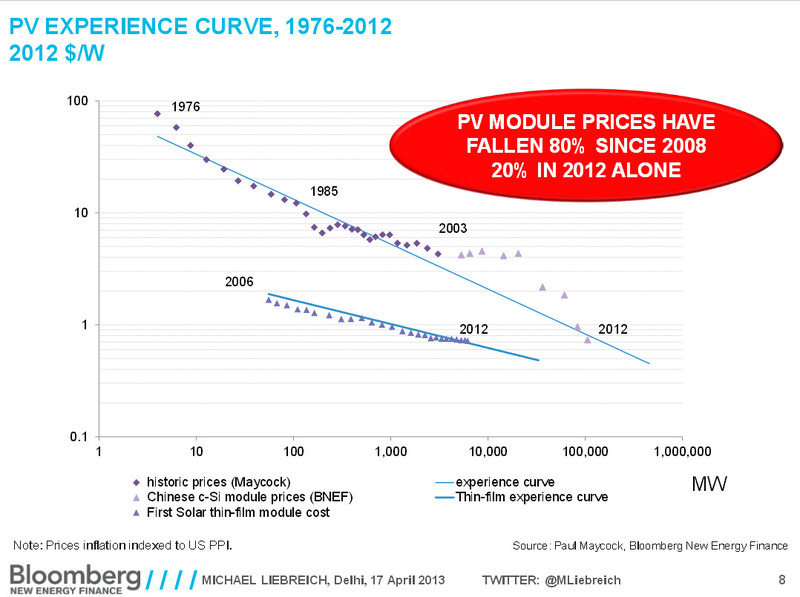 However, the low hanging fruit in PV in the US is more in the area of soft costs. Programs such as the one in Massachusetts is having a good deal of success at driving those down. And the Sunshot inititiative, that seemed like fantasy only a few short years ago, is starting to look like it may meet its goals.